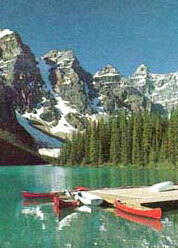 Maligne Lake, the largest in Jasper National Park (22 km). It’s one of the most beautiful sights in the Rockies, a popular day-use area, and the jumping-off point for boat trips and hiking trails. Enjoy a leisurely walk from the Tea House down to the 5th Bridge following the Maligne Canyon. This is the deepest canyon (50m) in Jasper National Park. Was this, at one time, part of the most extensive underground river system in North America or has 10,000 years of water flow created the canyon? Maligne Canyon Crawl: In the winter the water filled Maligne Canyon freezes to create a unique and interesting experience for the outdoor adventurer. You can walk on the canyon bottom and venture in behind the frozen falls for a breathtaking view.